He said, oh yea! Then 30 minutes later he emailed me some hand-drawn plans, and I asked if he had been looking on Pinterest. He was a bit disappointed to learn that he isn't the first one to come up with this idea. I told him I still think he's brilliant, and that made him feel better. The next day was one of his days off, so he brought home about $35 dollars worth of supplies, and put it together THAT day. It's amazing how I have to ask at just the right time, and then boom! Things happen quickly. I don't have a picture of the jigsaw cuts because I wasn't there. Those cuts were made by tracing part of the top of the bucket on the board three times. The pictures are better at explaining this than I am. It looks like scallops. Upside down. Oh nevermind, I have no idea how to describe this. Anyway, the fifth 2x4x8 was cut into 4ths. That was simple enough. Now that everything is cut, it's time to assemble. The first two legs were attached to two of the scalloped boards. Jeremy attached the first scalloped piece 17 inches above the ground, and the second piece 16 inches above the bottom line of the first (33 inches from the ground). 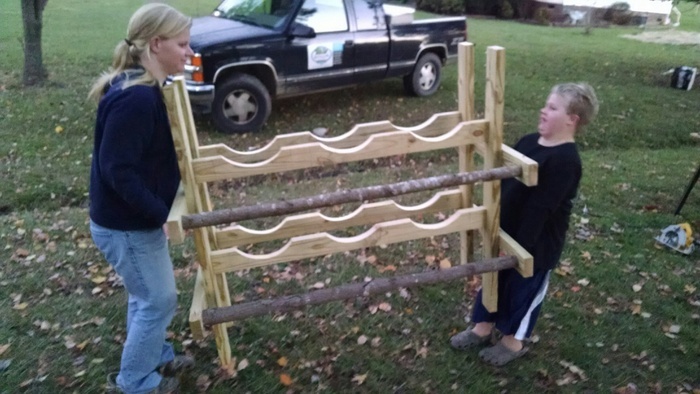 Then Jeremy attached the second two legs and two scalloped boards. 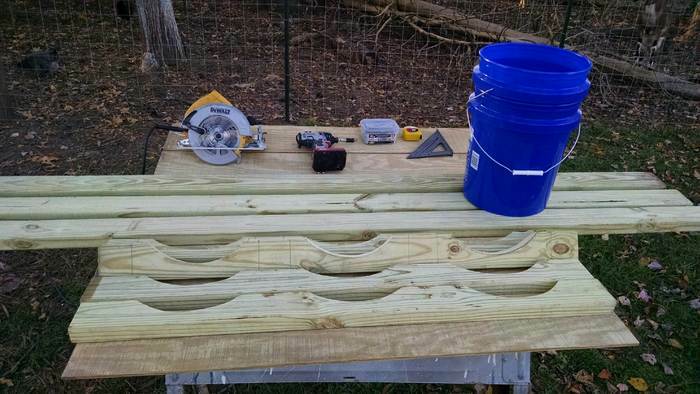 This is for the back of the nesting boxes, and in order for the buckets to lay tilted downward, Jeremy lowered the scalloped boards by 1 inch on the back legs. So those are placed 16 inches from the ground, and 16 inches from the first line (32 from the ground). Now there is a front piece and a back piece. Jeremy used the four pieces of the fifth 2x4 to put these together. Level ground would certainly help here, but we did it on a slope. He screwed in the two bottom boards first, and then the top two. He let the boards stick out a good 8 inches on the front. But this length is determined by how big your bucket is. A typical 5-gallon bucket, as our's are, needs about 16 inches. I don't have any pictures of Jeremy attaching the very first bracket because I was helping hold the front and back level (ish). Finally, it's time to cut down a sapling. 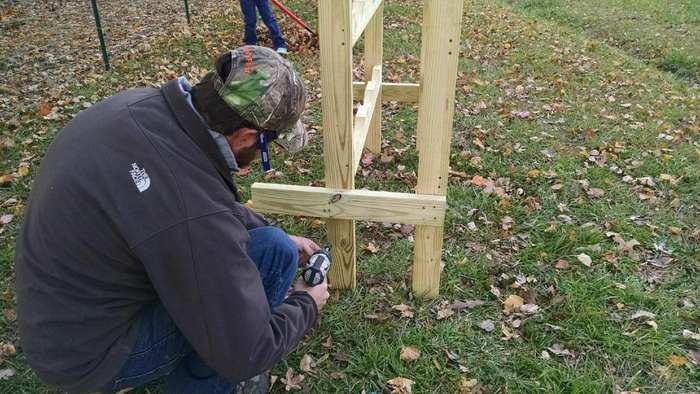 Jeremy chose a 3-4 inch sapling in the woods and cut two pieces from the trunk to make the roosting steps for the chickens to climb to get into the buckets. 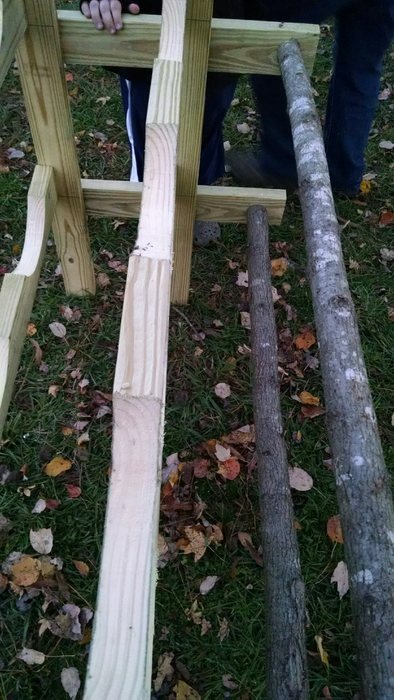 He measured in between the two boards that are sticking out of the front, cut the sapling piece, and tapped it into place. He screwed it in using wood screws. This really solidified this stand. Time for the buckets! 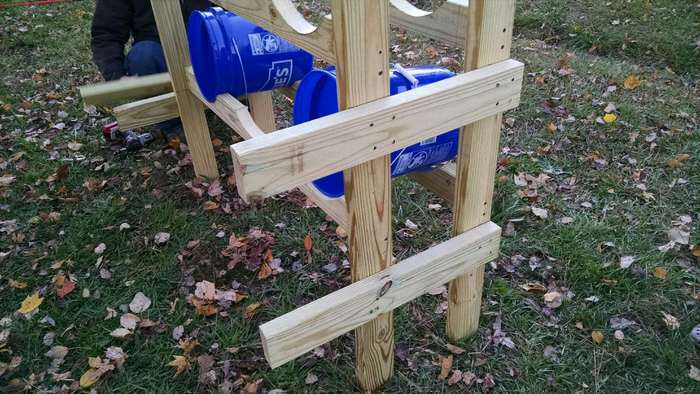 To help keep the buckets secure, Jeremy attached each bucket to the front rest with a small screw. 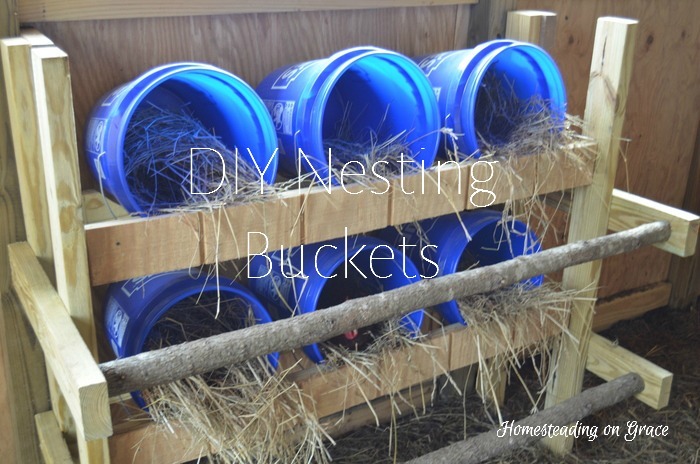 We didn't want the chickens to feel insecure while sitting and laying our eggs in these buckets, but we did want to be able to pull the buckets out occasionally to clean them. It won't take for much work to unscrew them every once in a while. 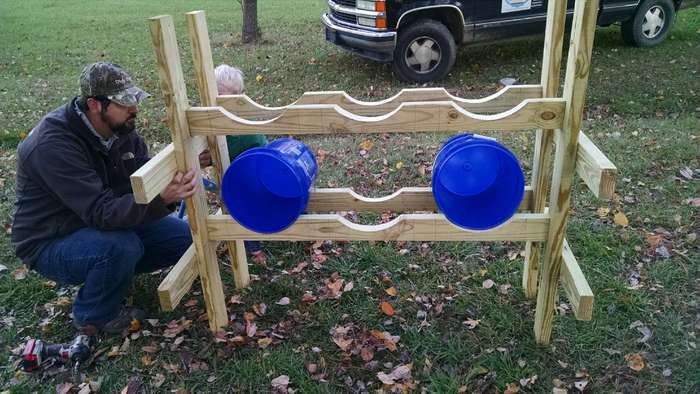 After that, we put the buckets and stand in the coop and let the chickens mess with it for a few days. 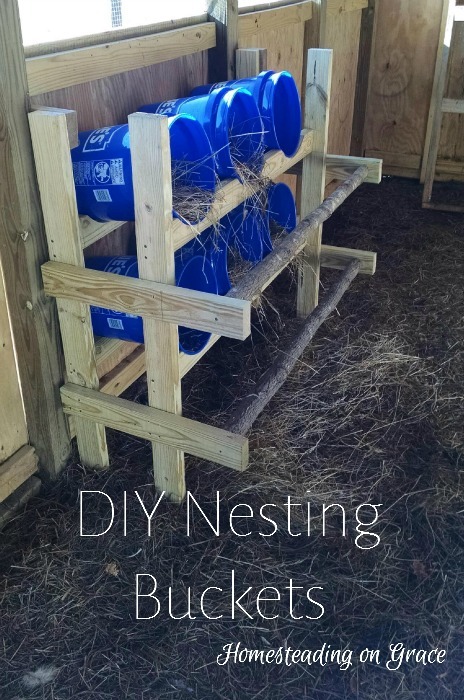 We noticed the chickens were knocking all of the hay out of the buckets when they were climbing in and out. So Jeremy took some extra boards he had laying around from building the coop to make a little lip in front of the buckets. 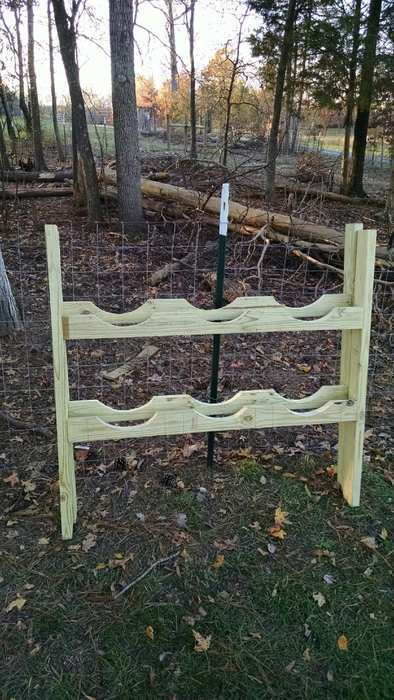 Now the chickens feel a little more secure. See? Nice and cozy. Lay, chicken, lay. Lay your beautiful delicious eggs right where I can find them without having to bend over the backside of goats. Thanks! He did do well. What a simple and effective idea! We are hoping to buy some land soon and are looking forward to getting some chickens and guineas. Thanks for the idea! You are going to love having chickens and guineas Kristi. It's so much fun! Thank you, it genius in it's simplicity!